From tradition to innovation ArtGlass, Production&Design The heir to an ancient glassmaking institution – the School of Design for Glassmakers founded as far back as 1862 by abbot Vincenzo Zanetti – the Abate Zanetti School of Glass of Murano is now more than ever the meeting place between past and future in the art of glassmaking. 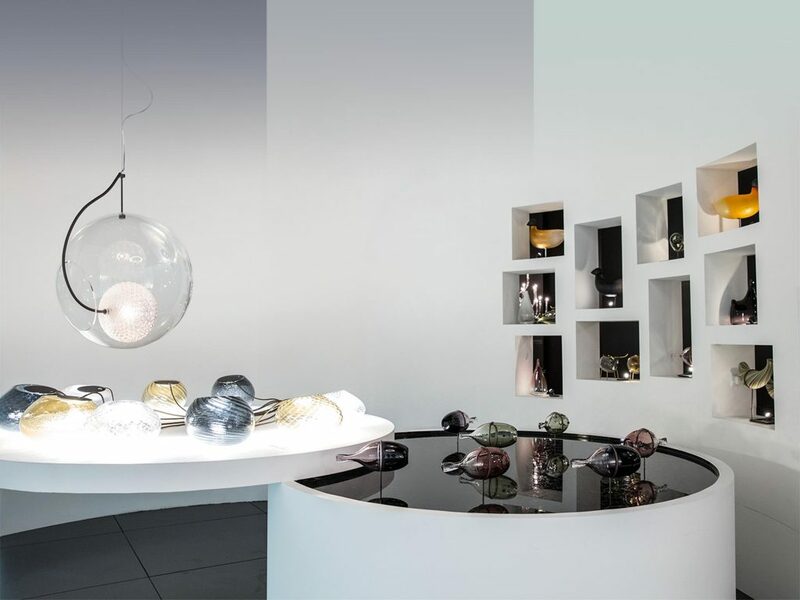 A strong desire to aggregate the multiple realities of the contemporary glassmaking landscape, looking to the world of design, culture, art, is combined with the preservation of a thousand year-long tradition and technical expertise typical of the island of Murano. 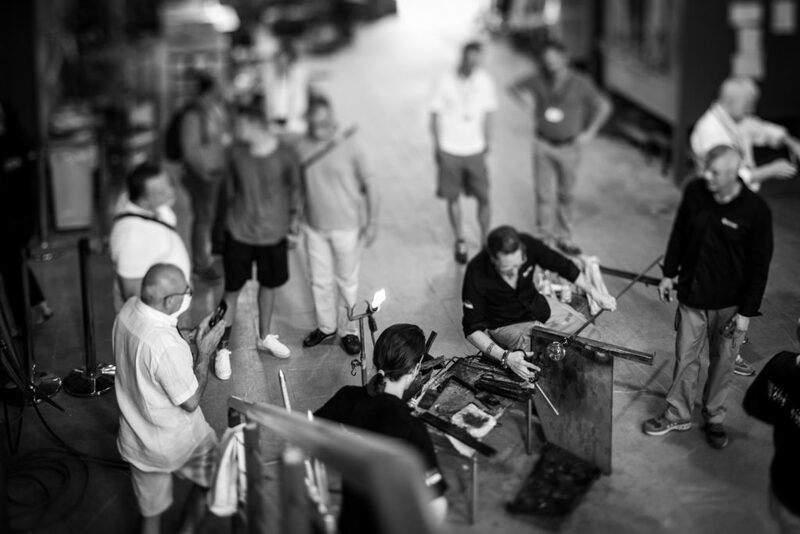 The structure is equipped to deal with all the typical Murano production techniques: furnace, lampworking, fusing and grinding. The School has two souls. 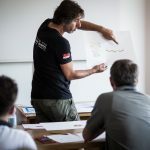 The first is education, which draws inspiration from its origins, and is achieved through the implementation, coordination and promotion of highly innovative training activities. 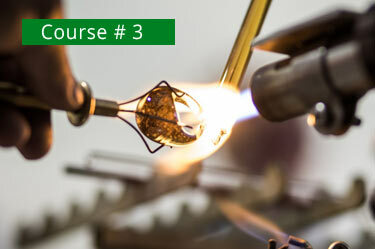 The courses provide training in both traditional and contemporary techniques and methods of artistic glassmaking, as well as on general topics related to technology, design and marketing. 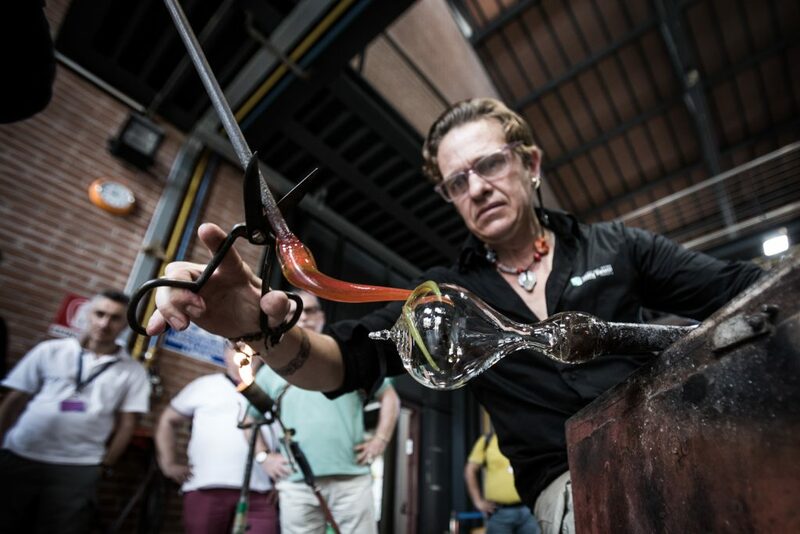 In addition to collaborating with Italian and foreign universities and institutes of higher learning, the Abate Zanetti School is a place of reference where cultural events are organized on a regular basis and the art of glass is deservedly celebrated, enhancing the international vocation of the city of Venice. 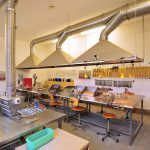 The premises are sited in a characteristic 1930’s industrial building in the heart of the island of Murano, which has been completely refurbished while maintaining its original style. It is a unique location, ideal for hosting exclusive private or corporate events like meetings, conferences, conventions and exhibitions. 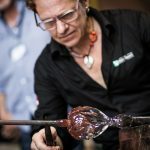 But above all, it is a place providing an opportunity to express one’s ability and creativity working with glass, a material which for its intrinsic characteristics dictates the pace to all those wishing to master the art. 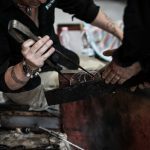 The second soul, in keeping with the first, is that of production, a natural progression tending towards the opening up of new opportunities in a market that requires innovative solutions. 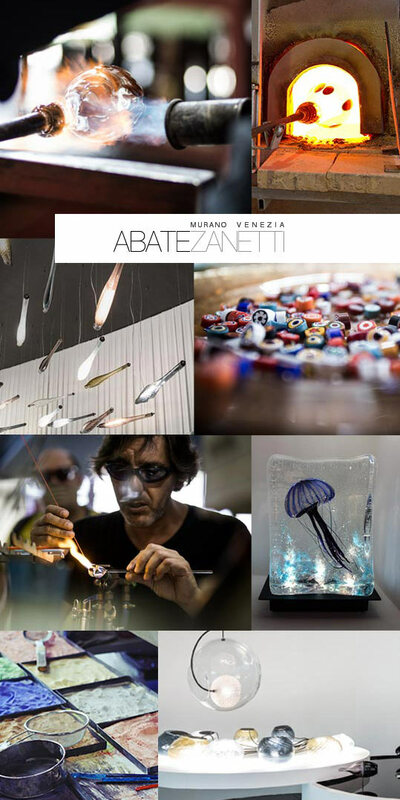 Indeed Abate Zanetti is now also a centre of excellence in the manufacturing, research and experimentation in state-of-the-art glassmaking design and artistic production, and is able to realize works of art in glass to order, starting from a project by the customer (with the ensuing elaboration of the design and prototype) or following a designer’s instructions. 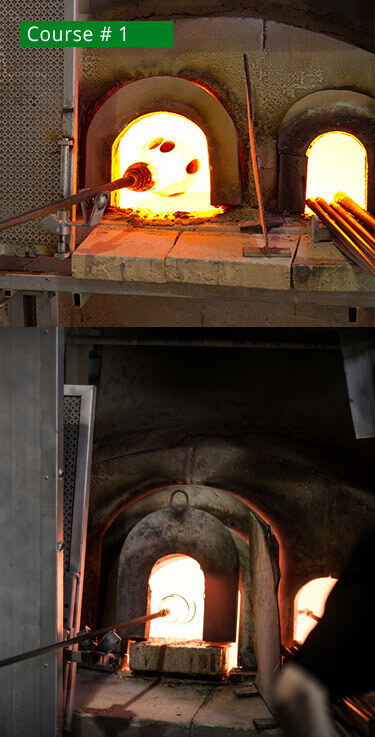 The School's furnace is equipped to deal with all the typical Murano hot working methods: from blowing to sculpture. Among the hotshop techniques, that of glassblowing in particular, discovered as far back as the end of the 1st century B.C. 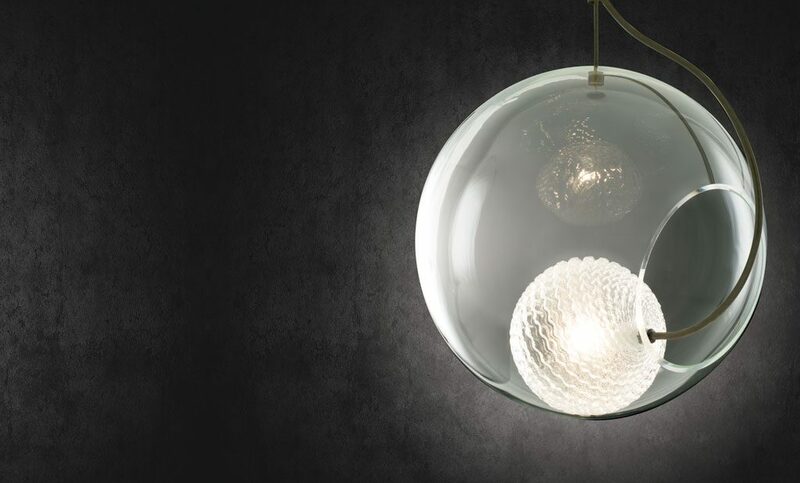 in the Middle East and widespread in Roman times, allows you to create everyday objects, from decorative elements to lighting. 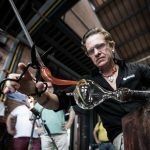 Glassblowing is also used to craft drinking glasses – especially the traditional Venetian goblet – and plates and vases. 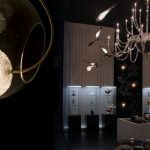 Various hot-worked decorations are applied to it, resulting in the development of complex techniques such as filigree and zanfirico, reticella, hollow-core and murrine working and incalmo. 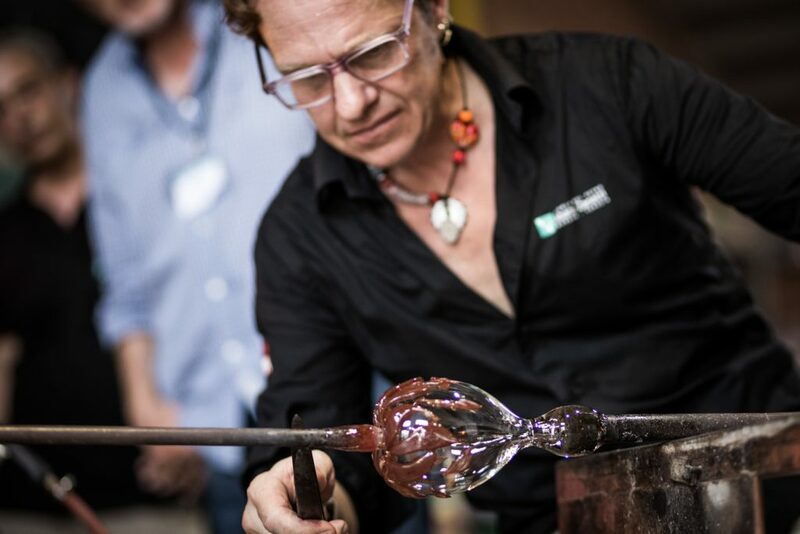 The working of massive pieces of glass allows the creation of sculptures and design and artistic objects. 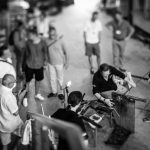 The aim is to acquire familiarity with the basic techniques of hot processing of glass and to travel back in time, through the practice of these techniques descended from an ancient tradition, thanks to the continuous oral narration of the most ancient method of glass production. 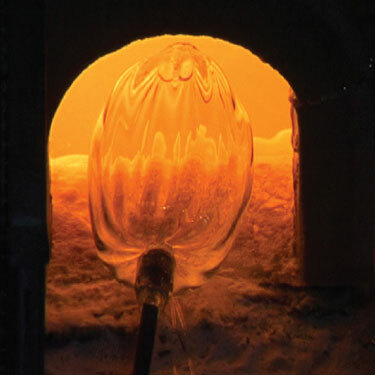 Students will learn how to take the glass from the furnace (first removal), how to set the core of the glass object (through marbling and glassblowing), how to then remove it and give a first shape to the vitreous mass, how to prepare a pontello for hanging, turning the glass for the master, up to the production, first with help then alone, of simple objects like a water glass or a bowl. 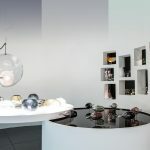 Also called thermoforming, glass fusing, born in more recent times, allows you to create a variety of objects and works by using various types of materials: the flatbed, resting on compatibile surfaces, can take on, at high temperatures, an infinite number of shapes; glass tiles suitably shaped and combined with glass oxides, glazes or other substances give rise to "pictures" with multicoloured effects and unexpected depth. Glass fusion makes it possible to produce stained glass, giftware, sculpture-tiles and jewellery with numerous painting-like details. 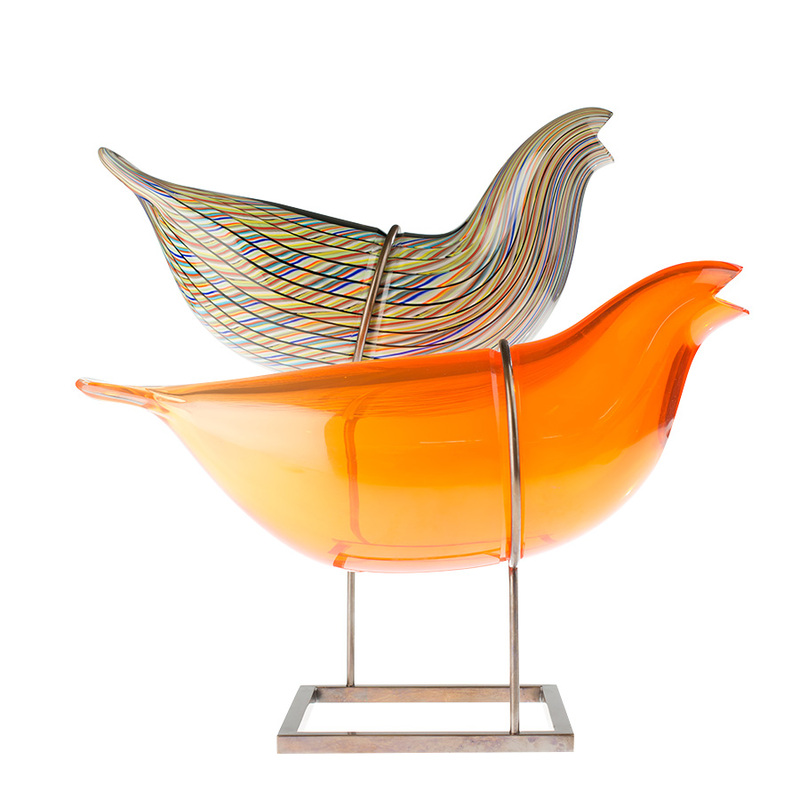 Starting from colourless glass and working on various superimposed layers, one obtains, on a single object, a set of contrasting colours or tones in sequence. 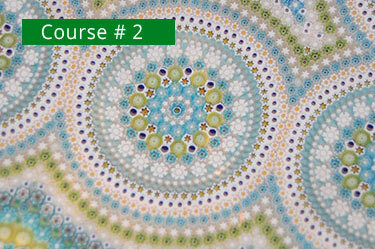 The course for beginners introduces one to the fundamental techniques of flat fusing. 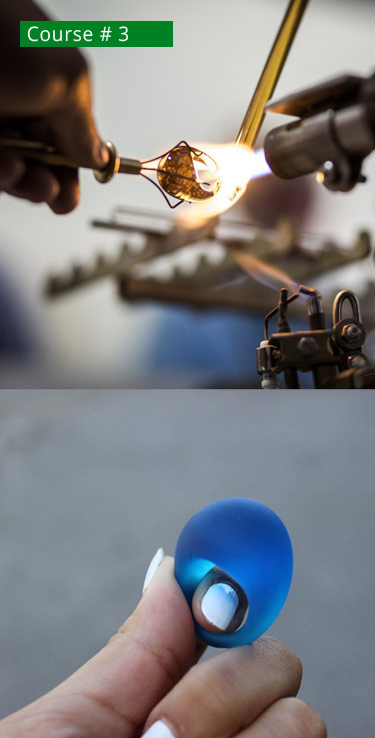 The cutting, assembling and firing of simple objects, will allow students to learn about the possibilities and limitations of this technique. 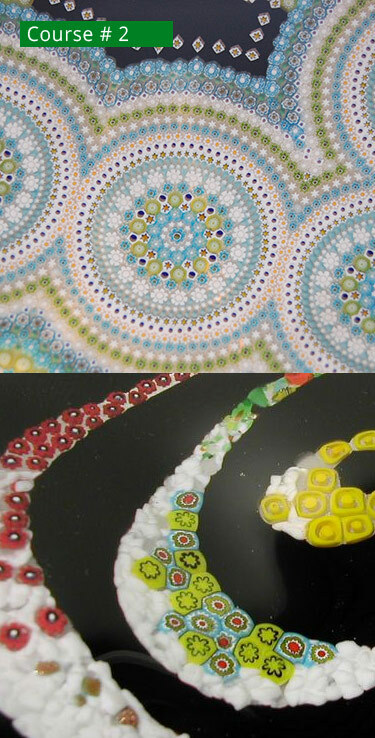 Once the students have achieved a good understanding of the basic techniques, they will face the technique of fusing in multi-layered thicknesses, using semi-worked materials and the application of increasingly elaborate working techniques. 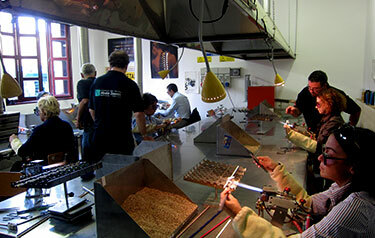 Students will also explore the methods of thermoforming and the use of different types of moulds. This technique has been applied in Venice since the Renaissance and later developed in the 18th century. 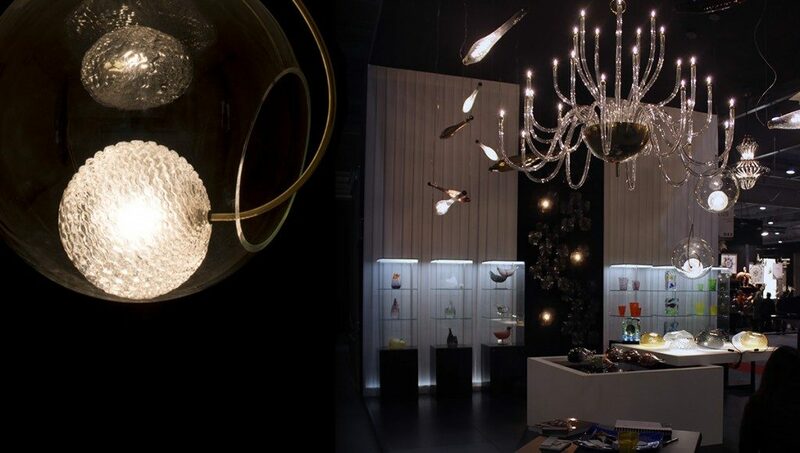 It consists in shaping semi-finished products in the form of tubes and rods, with different diameters and thicknesses. 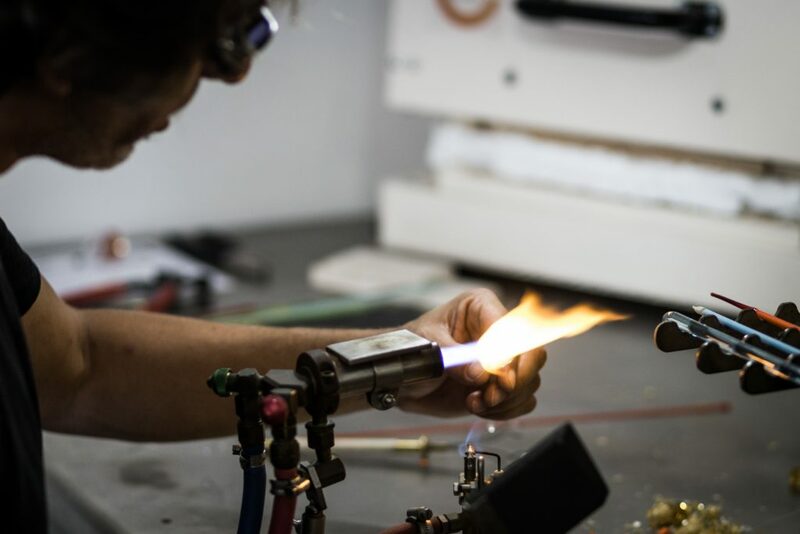 First one softens the piece with the heat of a horizontal flame fueled by methane gas and oxygen (or air), then one models it with small tools, possibly shaping it into a human or animal figure. The pearls are obtained by winding the melted glass around a copper or iron wire coated with a refractory material. 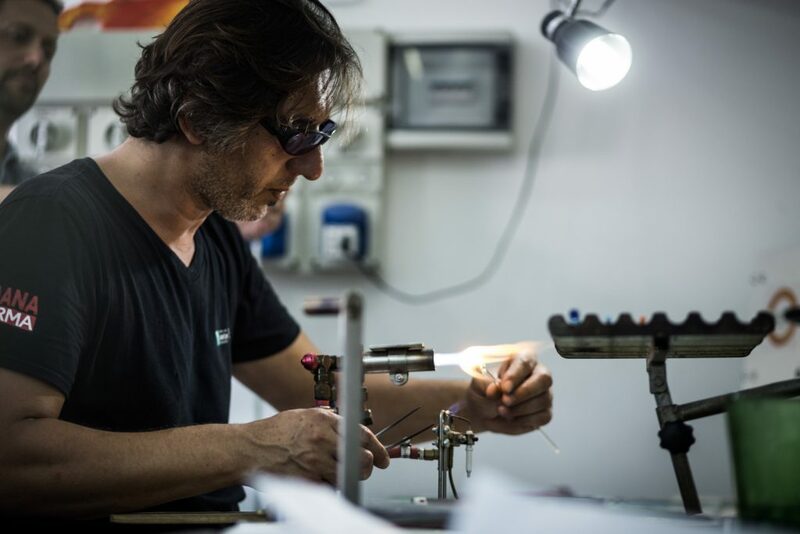 Through glass blowpipe modeling, you can create sculptures, figures or jewellery, pendants, rings or necklaces. 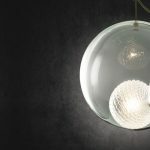 On account of the lower temperature, the mixture of gas and air allows for more delicate decorations, typical of the Venetian pearl. Students, after receiving information about equipment and safety, will be introduced to the technique of modelling. 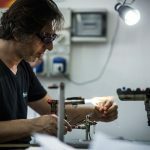 The aim of the course is the realization of the first elementary objects, performed first by hand and then with the use of clamps using rods of different colours and sizes. 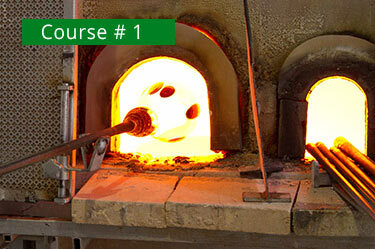 The course teaches the basic techniques, in order to deal later in another course with the pearl, massif and blown glass techniques. 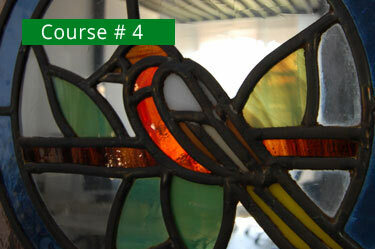 The course allows you to design and realize stained glass bound to lead or copper foil (the "Tiffany" technique). 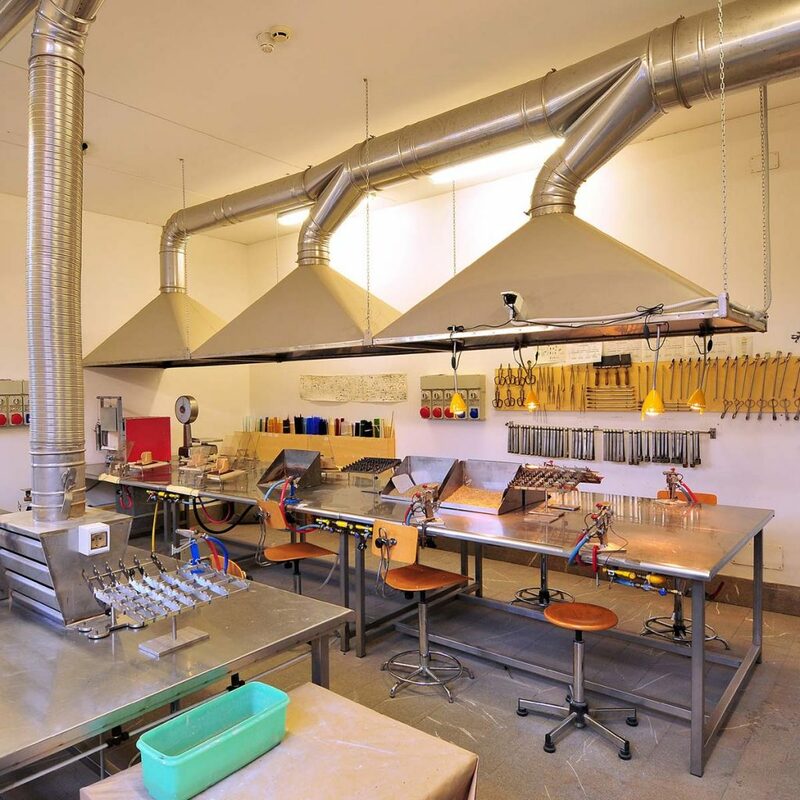 In the lab, equipped with tables and tools, students will acquire knowledge of the materials and processing phases and the course will promote the development of their aesthetic sensibilities. 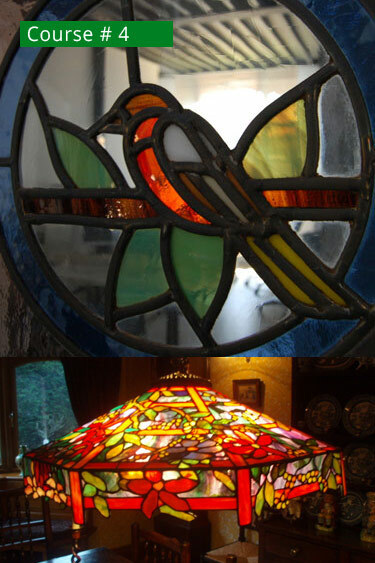 At various stages of processing, students will use the glassmaking techniques of ancient and contemporary stained glass (also by preparing patterns on paper and portions of decorative stained glass from the past) and the various methods of assembly. 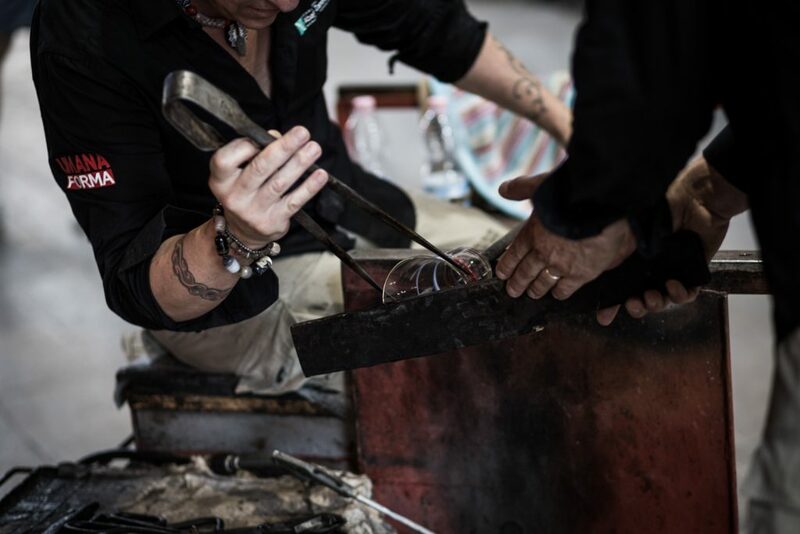 The course will teach the functional concepts of the stained glass window, glass plate, glass panel, glass container, and glass elements for interior architecture. 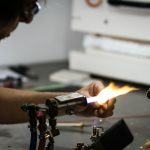 In some cases the students will be in contact with different techniques for glass: from glass fusing to grinding, smoothing and polishing, painting and grisaille-firing techniques. A world of Endless possibilities. 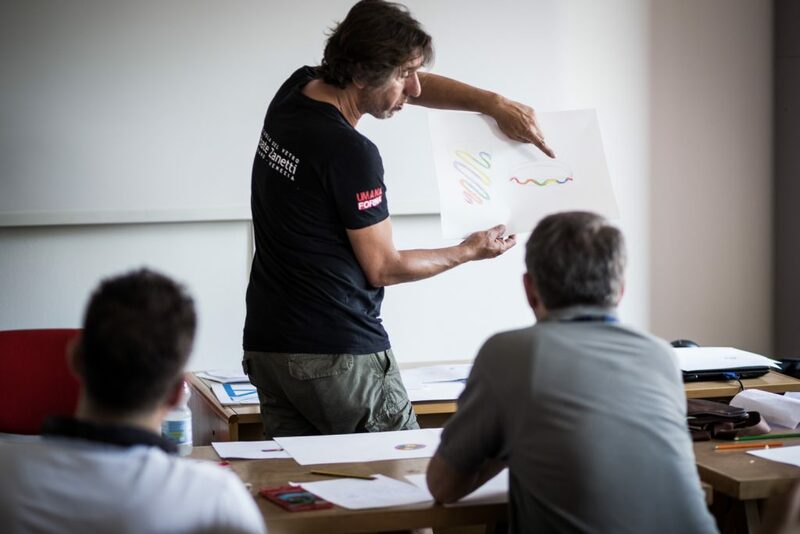 Are you interested to Abate Zanetti courses? Please contact us.